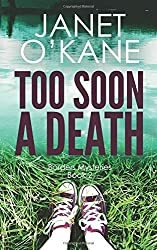 J anet O’Kane’s second book Too Soon a Death follows on from No Stranger to Death, set in a fictional village in the Scottish Borders and continues the story of Doctor Zoe Moreland, a widow and one of the doctors at the local health centre. A boy’s body is discovered on the banks of the River Tweed, near the Chain Bridge, linking Scotland and England and Zoe is asked to help identify the body because he had a note in his clothing giving the health centre’s address and phone number – but he was not one of their patients. Zoe is not without her own problems. I think this book reads well as a stand alone book, but it certainly helps to have read the previous book, which explains her current condition. At the beginning of Too Soon a Death she is still recovering from a vicious attack (details in No Stranger to Death) and is heavily pregnant. As the events unfold, she receives anonymous phone calls and is followed by someone in a blue car, who at one point almost runs her down. Added to that her best friend Kate Mackenzie, a deaf genealogist, is having problems both with her ex-husband and a client, with disastrous results. Can Zoe trust a new acquaintance, the vet Patrick Dunin – she wonders who it is that keeps phoning him claiming his attention? A large, vicious looking dog attacks Zoe’s own dog and is savaging sheep. Where has he come from? And that is not all – Zoe has secrets in her own past that are finally revealed in this book. In some respects Too Soon a Murder has a Midsomer Murders atmosphere, and a general ‘cosy’ feel, but it is not without violence. Its main focus, however, is on Zoe, how she is coping with her pregnancy, her plans for Keeper’s Cottage, which she has bought from Kate’s brother and her hopes to become a partner in the health centre. The crimes are investigated by DCI Erskine Mathers and Sergeant Trent, with Zoe’s assistance, although there are things she can’t tell the police because of patient confidentiality. It has a great sense of location (this may be helped because I know the area a little bit, living a few miles away on the English side of the Border), and the characters are well grounded and believable people, even the minor characters such as Margaret Howie, the practice receptionist, comes across as a character in her own right. My thanks to Janet O’Kane for providing me with a copy to read and review. I’m looking forward to reading her third book, which she is currently writing. Reading challenges: My first book for the Read Scotland Challenge – a book set in Scotland. Sounds good Margaret. I’ve been following Ms. Kane on Facebook but haven’t got one of her books yet. The setting for this one sounds really appealing, Margaret. And it’s good to hear that the characters are also solidly developed and interesting, too. Glad you enjoyed it.